When the Detroit Red Wings want to sell more tickets, celebrate marquee moments, or thank fans, the ice-hockey team turns to digital billboards. According to Rob Mattina, vice president of marketing for the Red Wings, these out-of-home (OOH) assets play an important role in the Red Wings’ marketing mix because the brand can easily change messaging to accommodate needs. And while digital billboards give the Red Wings flexibility, they also illustrate how OOH assets broadly–and billboards, specifically–are evolving. According to OOH trade organization Outdoor Advertising Association of America (OAAA), OOH has a storied history that can be traced to obelisks in Egypt, but also includes circus posters in the 19th century and a holiday campaign from Coca-Cola in the early 20th century that gave rise to our modern interpretation of Santa. Insiders now say these once static assets are undergoing profound change, which means OOH is poised to thrive in an era of data, analytics, and micro-moments. In fact, according to OAAA, OOH revenue was up 4.6% in 2015 from the previous year for a total of $7.3 billion, which marks an all-time high after 23 quarters of growth. Here’s a closer look at how experts told us this so-called renaissance is playing out–and why the seemingly underappreciated OOH sector is more relevant than ever. “We are creatures of habit. We drive down the same highways, we take the same trains, and we pass the same billboards,” Tan said. 2. Consumers can try to ignore billboards, but they’re always there: OOH is the only medium consumers have to interact with as soon as they go outdoors, said Arthur Ceria, CEO of digital marketing and media relations firm CreativeFeed. “There is a choice about whether or not to check your phone, go online, or hop on social media, but an OOH ad will just be there–displayed next to you at a bus stop [or] on a billboard while you wait for the traffic light to change,” Ceria said. 3. 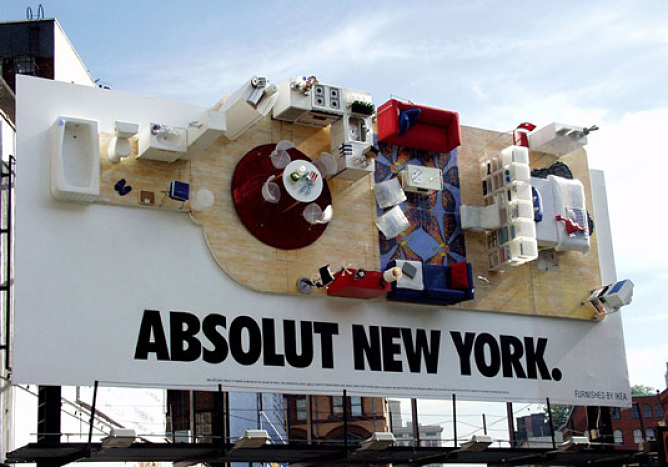 Billboards and digital/social/mobile are better together: New media channels don’t tend to replace older ones, but, rather, they find “a happy form of co-existence,” said Mark Mulhern, president of the East region at digital marketing agency iCrossing. Indeed, the integration of data and technology means advertisers can tap into OOH like never before. “And it’s really shifting into bringing back the things that digital has kind of lost–the sensory experiences, feelings, and interactions,” Ceria added. And with the rise of connected and driverless cars, expect to see much more interaction between physical outdoor assets and mobile devices. In fact, said Dan Hight, senior vice president of channel partnerships at mobile location platform xAd, marketers can extend the reach of OOH placements by geofencing place-based ads and delivering display ads on mobile phones when consumers are in proximity to a given billboard. “We call it the ‘priming effect’–the power of the billboard plus a mobile ad [yields] higher performance of the ad than a mobile ad alone, and being able to have an ad that is reinforced by mobile is producing higher results than the industry average,” Hight told CMO.com. 4. Advertisers are getting really creative–and including some truly whiz-bang features: Take the Xbox Survival billboard, for example, in which eight Lara Craft fans attempted to outlast each other on a billboard while exposed to extreme conditions. Other memorable executions in recent history include BA’s Look Up campaign, which displayed real-time information about flights overhead, and Coke Zero’s drinkable billboard at the 2015 Final Four. Examples also include an increasing number of contextually relevant executions from brands such as Dannon Yogurt, which is adjusting its messaging on billboards in Toronto and Montreal based on real-time traffic. What’s more, earlier this year, Posterscope worked with Chevrolet on billboards in Dallas, Chicago, and New Jersey for its Malibu model, which used vehicle-recognition technology to identify the front grills of oncoming cars from 1,000 feet and to display conquesting messaging when it identified a Nissan Altima, Toyota Camry, Honda Accord, or Hyundai Sonata. According to Tan’s figures, an ensuing measurement study found consumers were 50% more likely to recall the ad as a result of this quasi-personalization. Ian Dallimore, director of digital innovation and sales strategy at outdoor advertising company Lamar Advertising, agreed that contextually relevant creative helps break through the clutter. It can be as simple as weather-triggered messaging for raincoats from the Gap when it starts to drizzle or heated steering wheels for GM when it’s cold outside, he told CMO.com. “It’s using innovations and technology to be a part of a consumer’s life pattern,” Dallimore added. 5. OOH can tap into data now, too: According to Tan, billboards are only getting smarter thanks, in large part, to audience data derived from on- and offline sources, such as the websites a consumer visits, where he or she is likely to live, and social sentiment. To that end, insight generated by proximity technology, which enables marketers to tap into mobile data to monitor how many people walk by a given location, as well as how frequently they do so–and even what types of phones they have–can be folded into brand experiences, said Manolo Almagro, senior managing director of retail technology and innovation at marketing agency TPN. This also allows marketers to deliver better messages than simply erecting a billboard based on a theoretical number of eyeballs. Indeed, consumers have certain expectations when it comes to personalization in marketing, and OOH is no exception, said Wade Forst, senior director of emerging experiences at interactive agency Razorfish. Ergo, advertisers may not be able to get as one-to-one with a billboard as, say, an email, but they can still use OOH data to speak to demographics, time of day, or events to deliver memorable content. 6. With data comes measurement and optimization: While measurement and attribution have lagged in OOH, Cindy Gustafson, chief strategy officer at media and marketing services firm Mindshare, noted partnerships between OOH asset providers such as Clear Channel and measurement companies such as Placed or PlaceIQ allow marketers to explore behavior after consumers have been exposed to certain messages. 7. Programmatic is coming: Further, Tan said, OOH is catching up in terms of how it buys inventory in real time, like its online cousins. However, OOH has a long way to go, in part because the supply of physical assets is finite, but also because the industry does not have audience data integrated with available offerings, and it lacks a common set of standards, he noted. Indeed, Andrew Sriubas, executive vice president of strategic planning and development at OOH media company Outfront Media, said his company’s billboards can be bought in an automated fashion, although not necessarily with real-time bidding just yet.